We wanted to dunk ourselves in this Ben & Jerry’s milkshake machine. 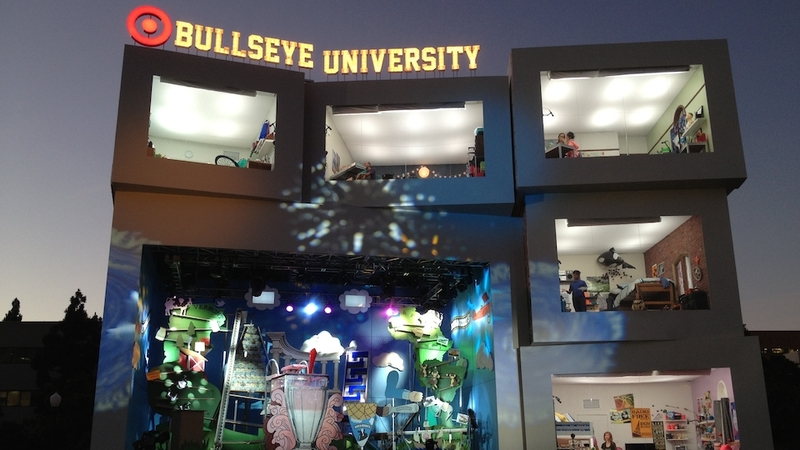 The Bullseye University for Target event was one of the largest to date for the retailer and was awarded many accolades for the amazing scale of the production and the millions of unique impressions it received. SCPS Unlimited was tasked by the ice cream mogul Ben & Jerry's to make a truly unique one of kind Rube Goldberg machine for the main area of the event. In case you don’t know, a Rube Goldberg machine is a contraption built of levers, ramps, slots, pulleys, etc., through which a ball travels once it’s triggered. For this ultimate cross-promotion with Target & Ben & Jerry's we collaborated on an online live streaming event that featured an elaborate Rube Goldberg machine with an ice cream twist. From start to finish, our Rube Goldberg machine was a flurry of activity, with various routes and an assortment of gadgets for the balls to go through. But here’s the catch: there were multiple balls in play at one time — all of which were triggered by user Twitter activity. And when enough balls reached the end of the device, internet-famous celebrities were dropped into a huge milkshake dunk tank. From our perspective, this unconventional interactive commercial was more memorable than a ginormous ice cream sundae on your birthday. And for those of us who tried out the milkshake dunk tank, it was also pretty tasty.